keeping Canada strong and free. A small token of appreciation for our freedom. Thank you. Thank you for your sacrifices to make our lives safer and free. We can never thank our veterans enough. Thank you. Your dedication is never forgotten. You are my heroes. THANK YOU! for our freedom in our beautiful Canada. Thank you for your service. May God richly bless you all the days of your life. We will not forget your sacrifice for our country and our freedom. Your sacrifice will never be forgotten. We are truly grateful for your courage and thank you for all you have done. With respect, honour and gratitude. Thank you veterans. Thank you all for your bravery and sacrifice to bring peace to our country. Thank you. We owe you so much. Words cannot express our thanks to you. A heartfelt thank you for your brave actions and sacrifices to ensure our freedom. 100th Anniversary of Vimy Ridge, We acknowledge the courage and sacrifice of those who served their country and acknowledge our responsibility to work for the peace they fought hard to achieve. In honour of Jack Tiernay, 96 year old Navy veteran and resident at Sunnybrook. We live good lives because of your sacrifice. Thank you and God bless you. I thank you for your sacrifice. From a little Dutch boy. I am raising a flag in memory of my two late husbands, both of whom served in wwII in the British Army. I thank all veterans for their service and our freedom. You will be honoured forever. Thanks for all you have done for we people of Canada. Canadians should never ever forget what our veterans have done for our country! Thank you. We remember you. With deep respect for all Veterans. Thank you for offering yourselves knowing the potential of supreme sacrifice. It is because of you we enjoy strength and freedom. Thank you for your sacrifice. We love & respect each of you. Many thanks for your service to Canada. Thank you for your commitment and sacrifice. Thank you for your sacrifices. They and you will never be forgotten. A sincere Thank You, to all the brave veterans who made us free. Many thanks for your sacrifices. We will always remember. Thank you - always and forever. To All of Our Beloved Veterans: Our Family Will Always Remember. Thank You. You are all loved and admired by fellow Canadians. Proud of you great grandfather - Tristan. Proud of you great grandfather- Abbey. Proud of you - Wendy. For those in the family who served. In memory of my husband and former resident Henry Gordon Kitts and all veterans who have ever walked through the doors of the Residence. Cpl. BF Inglis is remembered by his wife Rose and his daughter Pamela. They stood on guard for thee. Now you can give these brave men and women something in return. On November 11th, you can raise a flag in support of our veterans and make their day. Honour and give thanks for their sacrifice. Support Operation Raise a Flag today. Mel Storrier, 97, is a survivor in every sense of the word. At 66 years of age, while semi-retired and living in Etobicoke, he suffered a severe stroke that would change his life. Originally from Quebec, Mel was born in Rosemont, the centre-east part of Montreal. In 1939, at the age of 18 and still in high school, he decided to join the army, rather than be conscripted. 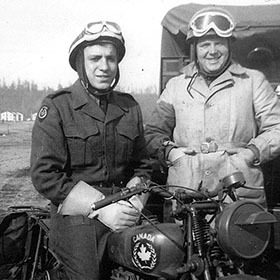 He served with the Royal Canadian Corps of Signals as a motorcycle dispatch rider delivering messages to the front line and signalman sending Morse code messages. In the summer of 1943, Mel and his unit participated in the Invasion of Sicily. Like many veterans, he never spoke openly about the war to his family. When he returned from the war in 1945, Mel studied at McGill University and graduated with a degree in engineering in 1951. It was there that he met his wife, Teresa “Lee” Eileen, and they were married in Montreal, prior to his graduation. Mel ran several companies during his career as a mining engineer, working mostly in Manitoba, Quebec, Ontario and Alberta. Mel has approached life with a great deal of determination. A life-long learner, he is a keen reader and frequent visitor to the library at Sunnybrook’s. Keeping his mind and body as active as possible has been important. Art therapy has also provided both great enjoyment and benefit. Mel always has a new idea and a “can do” spirit. “I’ve always had a little bit of art in me and I’ve just let it grow. It comes naturally to me,” says Mel. Whether he’s working in the art studio with fused glass or in the photography studio, Mel has shown that there is a great deal to life after a stroke. 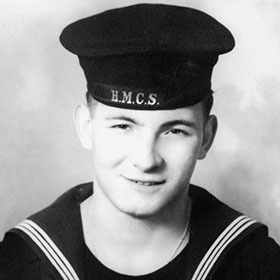 In the spring of 1942 and just shy of 17, Don enlisted in the Royal Canadian Naval Volunteer Reserve. Thanks to a phony letter of signed permission from his mother, he made it past the recruiting officer. Despite the fact that his parents were not on board with the idea, he ventured off to sea. As a junior seaman and gunner, he spent three years on the defensively-equipped merchant ships (DEMS) zigzagging across the Pacific and Atlantic Oceans delivering supplies during the Second World War. "Moving across the Atlantic Ocean, at only eight knots, we were sitting ducks, for the German U-boats," says Don. Over a period of three years, he saw more than 40 allied ships sink, fortunately he was never hit by a German U-boat or fighter bomber. In one 1944 convoy, a ship sank with another man named Donald Stewart on board, and Don's parents were notified that their son had died at sea. With no mail delivery, Don did not keep in touch with his parents and so they were unaware of this error. At the end of the war, he came home unannounced and shocked his father, a policeman who just happened to be at the train station meeting the soldiers returning. "He usually didn't show much emotion, but that day he hugged me long and hard. I will never forget that feeling – there wasn't much talking," recalls Don. His focus today as President of the Veterans & Community Residents Council, is to advise hospital administration in a constructive manner on issue related to the welfare of residents living in L-wing and K-wing, Canada's largest veterans care facility. Back home in British Columbia Don served as Legion Branch President in both Penticton and Kamloops. He has been a proud and active member of the Royal Canadian Legion for sixty-eight years. Friendships are very important to Don and at the Veterans Centre he keeps busy socially whether it's dinner out in the community, a Legion meeting in Niagara Falls or simply time together with his comrades in the Blythwood Social Club, a pub located onsite for residents and family members to socialize over a beverage. Originally from the Okanagan Valley in British Columbia, Don is the proud father of eight children, fifteen grandchildren and three great grandchildren. 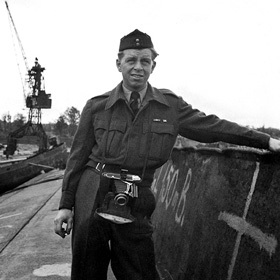 In November 1942, Edward (Ted) Hoare was conscripted into the British military first as a Trooper and later as a Commando with the British Commando Special Forces (Churchill’s Green Berets). In just over a year after joining the infantry, he was on the front lines of one of the longest, bloodiest battles of the Italian Campaign – the Battle of Monte Cassino. At the time, it was believed that the German troops were using the historic, hilltop Benedictine Abby as an observation post. From the deep slopes behind the Abby, they had full view and control of the entire Liri Valley - preventing the advancement and critical link up of allied forces to the north and the south. Ted also recalls the bomb raid that took place on the morning of February 15, 1944. Within four hours, 142 B-17 Flying fortresses, 47 B-25 Mitchells and 40 B-26 Marauder Medium bombers dropped 493 tons of ordnance on the Monte Cassino complex. From his slit trench deep in the mountain, he had a front row seat to the action as allied forces dropped their payload. Within a month, the Germans were driven out and on June 5, Rome was liberated. The cost of victory? Fifty-four thousand allied and twenty thousand German soldiers dead. Ted was eventually transferred to the Commando Unit. With his background in mines and explosives, he had the skills and experience they needed. However, tragedy struck when a farmhouse they were holed up in took a direct hit from enemy fire. His buddy was killed instantly. He and two others were gravely wounded. They were carried out under fire. He underwent surgery to remove the embedded shrapnel and spent the next six months recovering in hospital in a body cast that went from his neck to his knees. 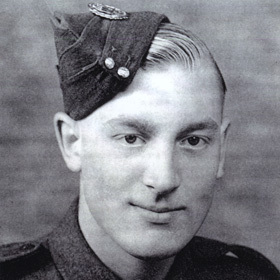 He celebrated his 21st birthday at the beginning of May 1945 and on the 8th, celebrated Victory in Europe Day (VE Day). Returning home, he met his wife Patricia who had also returned from being in the British Army. She served as a staff car driver in the same unit as the Queen. They married soon after. In 1957, they emigrated to Canada along with their three children. Bubba was born in Toronto on December 27, 1919, the younger of two children. His father a painter/ decorator and his mother an office cleaner, separated when he was quite young. While he would split his time between living with each of them, he says he was raised 99 per cent of the time by his mother. 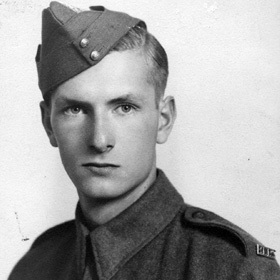 In 1940, when he was 20 years old and looking for adventure, he decided to enlist in the Canadian Militia. Promises of posting to Iceland drew him in. When it became obvious that that wasn’t going to happen, he and a few others moved over to the Canadian Scottish Regiment (16 CScotR) with hopes of being posted to Vancouver Island. However, after a brief initial training at Camp Borden north of Toronto, his unit shipped out to Debert, Nova Scotia to continue training before being sent overseas. The Regiment arrived in Great Britain in August 1941 as part of the 3rd Canadian Infantry Division. The next three years were spent in garrison duties, protecting the southern coast of England and training in preparation for the assault landings on Juno Beach in Normandy. On June 6, 1944, members of Bubba’s Unit were among those in the first wave ashore on that fateful day, sustaining heavy casualties. The rest of the battalion, including Bubba, followed in the second wave advancing further inland than any other landing force that day. Back home in Toronto, Bubba studied bookkeeping at a Toronto Business School. He eventually landed a job as an Information Clerk at Toronto City Hall where he worked for the next 30 years. 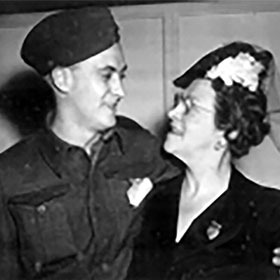 Bubba met and married his wife Margaret, the sister of his best friend, upon his return from active duty. They had two daughters and 2 grandsons. Bubba became an active member of the Canadian Scottish Association and remained in contact with a number of comrades he met during service. He has travelled back to France to Putot-en-Bessin where his grenade mishap took place for reunions on a number of occasions. 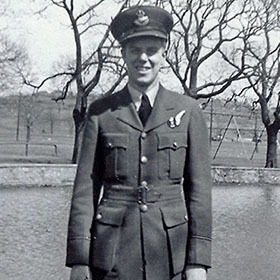 Mac enlisted in the Royal Canadian Air Force in Hamilton, Ontario at the age of 18. Following a year of training, he became a Navigator Bombardier and was posted overseas. After further training, he was posted with 101 Squadron in Lincolnshire, England. Responsible for pinpointing enemy targets on bombing runs over Germany, Mac flew 33 successful sorties in a Lancaster aircraft. He was often in harm's way and feared the worst, as anti-aircraft fire and shells were firing at his aircraft. "I was up in the front of the plane, right in the clear capsule, so I could see and feel everything along with sheer panic," says Mac. "I was a lucky one all right." It was a miracle that no one in his plane, a special duty squadron was killed. The eight man crew (five English and three Canadians) included a German-speaking wireless operator, who intercepted and interfered with voice commands from ground units who were directing the enemy crews. The normal bombing crews had a seven-man crew. Unfortunately, many of the Lancaster's in his squadron did not make it back. Out of 30 in his original squadron, 45 were shot down in just six months. New planes and crew where being added every day. "I don't think any of us ever imagined it was going to be like it was," said Mac. After the war, Mac returned to civilian life and eventually became President of Décor Metal Products, a division of Firestone Canada. At the time, they were the largest manufacturer of automotive safety seatbelts in Canada. Good times and leisure now fill his days at the Veterans Centre. Mac has no complaints. Keeping physically and mentally active are key to his wellness. Now days though, he prefers to travel by bus rather than air, taking part in community and out of town bus trips. A highlight was when he visited the Canadian Warplane Heritage Museum in Hamilton. Family was and still is very much his priority. His son, two daughters, and two grandsons visit him at the Veterans Centre and take him home for family gatherings often. For Mac, the war memories remain and are also meticulously tracked in his flight log book. The dates, hours, aircraft names, pilots, and places such as Frankfurt, Stuttgart, Berlin are noted in pen, along with "191 lost" in February 1944 noted and tracked in pencil. After joining up on her 18th birthday, Mary served in the Canadian Women's Army Corp. Her brother was in the air force and thus Mary wanted to do her part. "It was the thing to do and I was looking for some excitement I guess," she said. 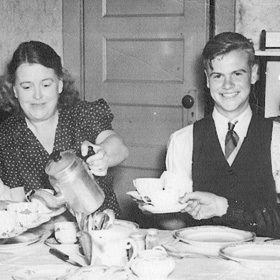 In her youth, Mary sang on the radio for the Eaton's Good Deed Radio Club when she was only eight. Then following a Christmas concert in Ottawa, she was discovered and recruited by a scout for the Army Show. 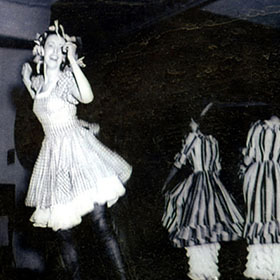 As an entertainer and dancer, she performed in the Canadian Army Show for Allied Troops in England, Belgium, Holland, and Germany from 1943 to 1944. Working with the show certainly brought its share of excitement. There was the orchestra, the singers, dancers and they even had their own cook. The show was entitled Show Boat and there were 35 in total in the show. Together six trucks crossed the channel, leaving from Surrey, England for a big adventure. For Mary, the experience led her to the love of her life, a stage manager who signed up with the Army Show, when he could have been discharged from the army. A member of the 1st Division, he'd been with the war since day one and had been involved in northern Africa and heavy fighting all over Italy. Luckily for Mary, he liked it there and didn't want to go home. Today, Mary is still as active as ever, using a power scooter to get around. Her love of music is evident and always present, as she travels in style listening to an iPhone playing all the old jazz and classical favourites. Each week on Wednesdays, Mary takes part in music therapy sessions offered at the Centre. "It's about my health now and music therapy is good for my mental, physical, and emotional health. Fortunately, I was able to bring my organ here with me. I love to play for the other residents in my unit." 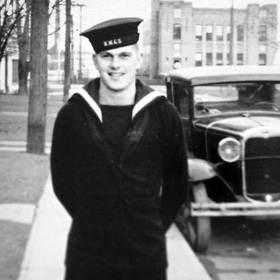 Donald (Digger) Gorman was 20 years old when he joined the Royal Canadian Navy Volunteer Reserve (RCNVR) in 1942. He left university half way through his third year to enlist. It was the thing to do, says Don. We were young. Our chums went in. We all did it. It didn’t seem tough at the time. I was stationed in the North Atlantic, primarily in Halifax, Nova Scotia – part of the Battle of the Saint Lawrence – Anticosta Island. As a member of the RCNVR, our primary role was to protect a block of up to 40 merchant ships that carried cargo to England to supply the war. That made them prime targets for enemy submarines. Our job would be to continually circle around them as they sailed across the ocean to keep the enemy subs from sinking them. When we were on convoy duty, we typically spent 14 days at sea and three days in port. In port, we usually had some drinks, good meals and we could go to the Red Cross and Salvation Army for free warm clothes, cigarettes, cake etc and maybe, before I was married, go out with a girl or two. During the war there were good times and bad times. The good times had to do with the camaraderie. Like the words from the old song: shipmates stand together, don’t give up the ship. On a ship if someone gets killed or wounded, you have to take their place, you can’t call in a replacement which is why during basic training we had to learn a bit about everything. So when you are at sea, there is a great sense of fellowship and loyalty among the men, I certainly remember that. It’s called esprit de corps. Any Vet will tell you that. The bad times of course were when you had to drop a depth charge (Anti-Submarine Warfare (ASW) weapon) on enemy submarines. That would be the worse thing we had to do. Once a ship was down, you didn’t shoot the people in the water, that’s not right. The purpose of a Navy ship is to sink ships, not kill people. I remember one time when we did sink a sub and the enemy – both dead and alive -- were in the water. We collected the dead, brought them onboard and wrapped them in canvas to be taken back to shore. Survivors were taken prisoner. While onboard, we treated them well and we fed them the same food that we ate. When it was time to go ashore, they offered us one of their hats. It was filled with their gold rings and watches – anything they had of value to give to us in appreciation for how well they were treated. Of course, we all refused. Don’t forget you could be in the water some day. That was what we were taught, so we always treated those enemy sailors who ended up in the water, the way we would have wanted to be treated if it were us instead of them. I’ll never forget that gesture. They were just young boys like us. After the war, Don went back to school to complete his third and fourth years. He graduated from the University of New Brunswick with a BSC in Geology. He studied economic geology as a graduate student at the Royal School of Mines in London, England and earned a PhD from the University of Toronto (U of T). Don worked for the U of T for 46 years. In the summer he did contract work for a mining company, focused on economic mineralogy in the northern most regions of Canada and all provinces except PEI. In 2009, he was inducted into the Canadian Mining Hall of Fame. My wife Reta and I got married during the war in 1944 while I was on leave. We were high school sweethearts and celebrated 70 years together. She died in 2014. Our family includes five children (three girls, two boys), ten grandchildren and seven great grandchildren. Throughout my life I’ve always been very active. I loved all sports, played tennis from the age of 12 to 85, skied and played hockey. I wasn’t a bookworm, didn’t let that take over my life, I was a scholar not a bookworm, I always make that distinction. Don’s busy life continues at Sunnybrook. A resident for four plus years, he’s active on three or four committees and is Vice President of the Residents Council. After participating in basic training in Toronto, they spent the next six months in Iceland before heading to England to await further orders. Those orders came on August 19, 1942. They were part of Operation Jubilee, which saw more than 6,000 Allied forces – including some 5,000 Canadians - converge on a 16 kilometre stretch of shoreline in Dieppe, on the northwest coast of France. 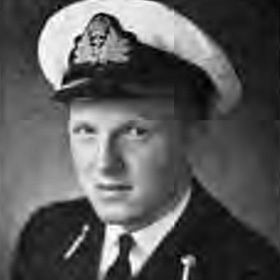 When Richard Ratcliffe left his home in St. Catherines, Ontario to enlist at age 17, he was on a quest for adventure, eventually travelling far from the Royal Canadian Naval College in British Columbia to the Mediterranean, the Middle East and the Western Pacific, as well as seeing active service during the Korean War. As a member of the Royal Canadian Navy, Richard participated in daring missions around the world, buoyed by a sense of pride in being able to defend the interests of the United Nations and NATO over the course of a successful military career that spanned roughly 25 years. He rose through the ranks, serving aboard 12 ships and ultimately as Commander of the famed destroyer the HMCS Qu’Appelle, with a crew of 230. During the Korean conflict from 1950 to 1952, he helped provide anti-aircraft and anti-submarine defence, which included escorting an aircraft carrier flying strikes into North Korea. Following active duty, Richard served another five years with the Royal Canadian Navy Reserve. Subsequently, he worked for the Maritime Council of Premiers in the Nova Scotia government, and as head of the residence at St. Mary’s University. In 1981, he and Mary Patricia, his wife of almost 50 years, established Cumberland County Knitters, a cottage industry that manufactured hand-knit sweaters and fashion accessories. While Richard’s naval career was filled with drama, one of the highlights of his life took place in 2017 when he soared over Niagara Falls by helicopter with his grandson Joe as part of the Sunnybrook Veterans Grant a Wish, a program made possible by donor support. Viewing Niagara Falls from the air had been a life-long dream of his. "As children, the Falls were always an attraction for us. The ride lasted just 12 minutes, but for me, it was the trip of a lifetime." His "can do" attitude and leadership abilities still characterize Richard at age 89. As a resident in Sunnybrook’s Veterans Centre for roughly two years he’s enjoying sharing stories and memories with his fellow veterans, but he lives very much in the present. In 2017, he was elected president of the Veteran and Community Residents’ Council. What’s more, that year he was also featured on the Toronto Star front page as one of three veteran bearers of the Invictus flag. Richard’s adventure continues, this time in service of his fellow veterans with whom he shares his youthful spirit and love of life. "The war was exciting, but right now is just as exciting," he exclaims. He is visibly moved when expressing his gratitude to Sunnybrook Veterans Centre for the outstanding care he has received. "We’re 475 of the most privileged people in Canada. We’re treated like royalty every day." At 20, Jack Ford saw the world through a different lens, when he joined the Royal Canadian Air Force (RCAF) and landed a spot in the, 414 Photo Unit Squadron. Carrying a small accordion style camera with him at all times, his job was to document history in action: civilians and children on the roadside, aerial views of bombed towns and sometimes still burning German enemy targets. For four years he has lived in the veterans' residence at Sunnybrook. Each week he visits his wife and true love Joan, who is in a nursing home only a short distance from the hospital. Along with distance, dementia has come between them. Some days she knows he is there and other times he's not so sure. "It's not the way I planned things would be, but I've come to accept it," he says. At the Veterans Centre, Jack looks forward to regular sessions in the photography studio with his art therapist. Together, they work with Jack's collection, discussing the different wartime scenes and scanning them onto a large iMac computer. "Even though I have macular degeneration and have very little sight left now, I have realized a new passion for photography and best of all my collection of old war photos, has been brought back to life!" Bill was a Gunner in the Korean War. He enlisted in the army at Chorley Park in Toronto, Ontario in August 1950 when he was 21. He felt it was something he had to do. The Korean War had just begun and both of his brothers had served during WWII. From Toronto, he went to Petawawa where he was outfitted before shipping out to the Canadian Forces base in Shilo, Manitoba for basic training. From Seattle, the men got on an American ship and crossed the International Date Line on route to Korea. “The trip took several days and we arrived either late January or early February 1951. We drove up the front, eventually setting up camp north of the 38th Parallel in enemy territory. As a gunner, my job was to fire a 25-pounder field gun which was mounted and pulled on a trailer. We’d set up several kilometres behind the frontline troops. We supported the Princess Patricia’s and the Van Doos. The Major, who was also on the frontline, would give orders and radio the coordinates for us to fire. If wrong, he would readjust them and we fired again. This continued until we hit the intended target. During this time they were deployed on or near Hill 355 so named on military maps because it was 355 metres above sea level. The Hill was strategically located just north of Seoul and was highly valued because it was the highest ground overlooking the surrounding front lines and supply routes. Bill recalls that they took a severe pounding there as both sides fiercely fought to gain control. Bill’s 18 month military commitment turned into two years. He returned to Canada on July 27, 1953. “When they sent replacements, you went home,” he said. Upon his return, his brother bought him a dump truck and he went into the trucking and excavation business during the summer. In the winter, he drove trucks for Texaco, Canada for 15 years delivering furnace oil until they shut down their Canadian operations. He later worked with Canada Post as a driver and letter carrier, and the TTC as a wheel-trans driver. He has 5 boys and 11 grandchildren. Sunnybrook officially opened in 1948 as a war veterans' hospital; a place to care for heroes. Today, as the largest veterans care facility in the country, in partnership with Veterans Affairs Canada, we are honoured to provide the best cognitive, physical, mental health and stroke care to 475 Canadian veterans of the Second World War and Korean War. What is the Raise a Flag campaign? As the largest veterans’ care facility in Canada, we offer long term and complex hospital care for vets from the Second World War and Korean War. In honour of this Remembrance Day, Operation Raise a Flag will help raise funds in support of the Veterans program at Sunnybrook. Please consider making a donation in honour of our veterans. With your support, 47,500 flags will be planted around our campus for Remembrance Day as a symbol of honour and appreciation. It is the mission of the Veterans Centre to assist each and every resident to achieve their best possible life experience while they are at Sunnybrook. Your gift will help Sunnybrook Veterans Centre provide the very best cognitive, physical, mental health and stroke care to 475 Canadian veterans of the Second World War and Korean War. We believe our brave veterans deserve nothing less. By giving today, you help ensure that every veteran we care for spends their time in comfort, benefitting from the best medical equipment and most compassionate care possible. By clicking the donate now button on this page. Yes. If you order your flag online, a tax receipt will be issued immediately to the email address provided. If you order through the mail or in person, a tax receipt will be placed in the mail and received within 10 business days. Can I purchase a flag for my mother, father, etc.? Yes, you can. However, the tax receipt will be made out to the individual making the donation. How long will flags remain on the lawn? We cannot guarantee the lifespan of these paper flags. Weather permitting, the flags will remain on the lawn throughout Remembrance Day and will be removed the morning of November 13th. What will happen to the flags after Remembrance Day? Flags are collected and recycled. Where are the flags manufactured? The flags are manufactured in Ontario and purchased from a local retail vendor — The Flag Shop. Can I dedicate my flag to a particular veteran? The flags will be planted on the grounds and messages will be combined for the veterans. If there is a specific veteran that you wish to honour, we will do our best to pass the message along to him/her. Can I keep my flag? This is not possible as the flags are not personalized and are planted all together. We are sorry but all volunteer opportunities are currently filled. Copyright © 2017 Sunnybrook Foundation. All Rights Reserved.